SANDERS/ SAUNDERS OF BRENTFORD, MIDDLESEX – A LINK TO THOMAS CROMWELL? 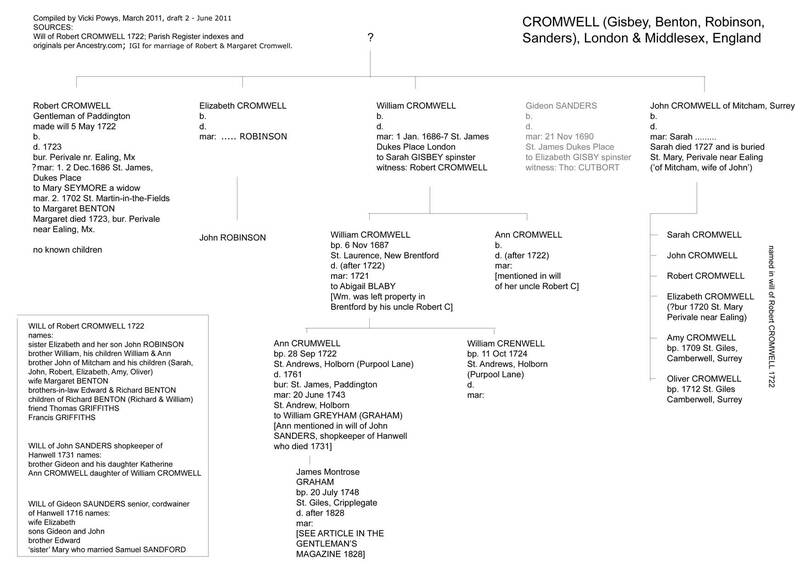 Vicki Powys researched possible links between he SANDERS/SAUNDERS family of Brentford and CROMWELL in 2010. In 2011Lynne Mace of Horsham provided a crucial new lead: the will of Robert CROMWELL of Paddington, written in 1722 and proved in 1724 in which he left a house in Brentford to his nephew William CROMWELL. Lynne provided a summary of her conclusions and Vicki has compiled a family tree for the CROMWELL family, based on all evidence to hand at present (April 2011). It demonstrates what progress can be made using on-line sources if you have a family that owned propery and left wills. London & Middlesex parish registers available on ancestry.co.uk were also important in proving family links. I have recently scanned some really old parish records via Ancestry.com, searching for my SANDERS and SAUNDERS relatives from Brentford, Middlesex. These records are not indexed and can be difficult to read. In particular, the St. Lawrence New Brentford records proved fruitful. Joseph (bn ca 1700-1730 [most likely 1715-1726], died 1778-9) shoemaker (made a will, left 20 pounds each to 4 children, and the remainder of his personal estate – unspecified – to his son Daniel.). I found a possible lead from Parish Records - one Joseph SAUNDERS was buried 14 Sept 1779 at St. Leonard, Heston with comment 'from Brentford'. There was also an Elizabeth SAUNDERS buried 25 Feb 1775 at St. Leonard, Heston, comment 'wife of Joseph'. So there may be a Heston link. In the earliest records from St. Lawrence, New Brentford, I found baptism dates for all of Daniel’s children (we previously only had their names from his will – see Appendix for details). Daniel died 1824 age 77 and is buried at St. Lawrence, New Brentford. It was interesting that in the early records Daniel’s name is consistently spelled SAUNDERS, but the names of his children exactly tally with the will of Daniel SANDERS, and in early records the names SANDERS and SAUNDERS seemed interchangeable. I found three generations of Gideon SANDERS/ SAUNDERS in the St. Lawrence records, with their children being baptized 1694-1730. A check of PCC wills turned up a Gideon SAUNDERS senior, a cordwainer of Hanwell, who died in 1716 and is buried at St. Lawrence. In his will, Gideon senior named his wife Elizabeth, two sons Gideon and John, a brother Edward, and a kinswoman Mary [CUTHBERT/ CUTBEARD] who married Samuel SANDFORD. Witness to the will was Thomas CUTHBERT. Probably Gideon senior’s son, another Gideon SANDERS, bachelor, married 1690 at St. James, Dukes Place to Elizabeth GISBY, spinster, witness was Thomas CUTBERT/ CUTBORT. In a third generation yet another Gideon SANDERS of Brentford, a butcher, married Elizabeth GOMB, spinster of Barnes, Surrey, at St. Benet, Pauls Wharf, London in 1716. See Appendix for details of their children. A Google search turned up an intriguing mention of two brothers, Gideon and John SAUNDERS. The Gentleman’s Magazine volume 98, 1828 (available free online) reported on a current court case. It mentioned that the brothers Gideon and John had married two sisters who were descendants of Thomas Lord CROMWELL (he who was beheaded by Henry the Eighth in 1540). I’m not sure if the sisters had the surname CROMWELL or not, but their nephews apparently did. Gideon and John for some reason had custody of their two young CROMWELL nephews, Robert and William, who as part of their Cromwell inheritance owned property in Brentford, Isleworth and inner London. The article says that Robert and William were sent, when young, to the West Indies. Robert died unmarried and William (born 1687) lived in the West Indies for some years, during which time the SAUNDERS uncles Gideon and John ‘received the rents of the estates to their use; and that great part of the property is now possessed by their descendants’ (i.e. as of 1828). It has been a puzzle to us family historians as to how George SANDERS, a cordwainer, came to be so wealthy, so perhaps there is just a little bit of truth in the above account, and which would therefore link George to Gideon SAUNDERS senior, a cordwainer of Brentford who had died in 1716. I decided to research this story, and the claims made in the Gentleman’s Magazine article of 1828. Property descended to William Lord CROMWELL, grandson of Thomas. William had two sisters who married two SANDERS brothers. William had two sons Robert and William [Wm. supposedly born 1687 and died ‘about 80 years ago’] and a daughter. Robert was older and died unmarried in the West Indies. William also went to the West Indies when young. William returned to England, married Abigail BLABY , had daughter Anne  . Anne CROMWELL born 1722 London, married 1743 William GRAHAM, and died 1761 [aged about 39]. Their son James Montrose GRAHAM was born roughly 1753 (‘aged about 75’ in 1824). In about 1814 James was claiming to be heir to several properties in central London, claiming rents from several houses in Vine Street and Millbank Street in Westminster whose occupants had never paid any rents. James also claimed that his relative William CROMWELL had at one time owned Boston House in Brentford. The lineage of Thomas CROMWELL as given in the Gentleman’s Magazine article is incorrect. Names are muddled and generations are missing. I checked online sources e.g. www.tudorplace.com for a comprehensive lineage of Thomas CROMWELL but there was no grandson of Thomas named William, nor two brothers anywhere in the CROMWELL tree, with names of William and Robert, nor any William anywhere who was born circa 1687, not that I could find anyway. Nor could I find any obvious evidence of a CROMWELL link to Boston House. However, some truths still remained! John SANDERS, shopkeeper of Hanwell who died 1731 and is buried in St. Lawrence, New Brentford, made mention in his (PCC) will of ‘Anne CROMWELL daughter of William CROMWELL’ (to receive one hundred pounds when she turns 21). Total value of his will was about 700 pounds. John also mentioned his brother Gideon SANDERS, and Gideon’s daughter Katherine (who was baptized St. Lawrence, September 1730). No wife or children of his own were mentioned, maybe they had died. So here at last was a link for SANDERS and CROMWELL! I found a William CROMWELL of London who married Abigail BLABY in 1721, and they had a daughter Ann who was baptized 28 September 1722 at St. Andrews Holborn, London (from IGI and parish records). Ann 'CRUMWELL' bp. 1722 fits in very nicely for the 'Ann CROMWELL daughter of William CROMWELL' who was left 100 pounds 'when she turns 21' by John SANDERS of Hanwell who died 1731. Further searching of the St. Lawrence New Brentford registers turned up another William CROMWELL, whom I am more confident is our man. This William CROMWELL was baptized November 6, 1687, his father was also William CROMWELL (mother’s name not mentioned). The date is spot on for the William CROMWELL claimed as a relative by James Montrose GRAHAM. I could find no siblings in a 10 year search prior to 1687. Somewhere there must be a burial record for the Abigail who married a William CROMWELL in 1721, but it is hard to know where to start looking in the unindexed records of that era. Perhaps she died soon after giving birth to her daughter Ann? And just who was this James Montrose GRAHAM who made all the claims about the CROMWELL-SANDERS connection in the Gentleman's Magazine in 1828? He turns up in the parish registers for St. Giles, Cripplegate, being born and baptized in July 1748, which would make him 80 years old in 1828. His father was William GRAHAM a bookkeeper and mother Ann. There were no other GRAHAM children baptized at St. Giles in this period. Ann GRAHAM died supposedly 1761, so her son James would have been only about 13 years old. James claimed that the William CROMWELL who was cared for by the SANDERS brothers had died ‘about 80 years ago’ so circa 1748. But perhaps this was mistaken reporting and should have read ‘died about 80 years of age’? This would tie in with the William CROMWELL who died in 1772 aged 79. Celia found a William CROMWELL, possibly linked to the above record, in the London Metropolitan Archives indexes. This man was a citizen and merchant tailor of London and had taken out a 200 year mortgage ‘of messuage etc’ in Ealing/ Brentford, June 1660. Details of the exact properties involved might be worth following up, from the original documents, to see if there is a link to property later owned by the SANDERS family in the 1800s. Of interest was a burial record in 1718 at St. Lawrence New Brentford of Elizabeth CROMWELL, child of coat-maker of St. Giles, London. I wonder if the name of the coat maker was William, and if so, what was he doing in Brentford in 1718? I also tried to find a link between my ancestor Joseph SANDERS (died 1778-9), and Gideon and John SANDERS, but so far without success. There were no SANDERS/ SAUNDERS in the St. Lawrence registers for a period of about 40 years (1730-1768), a time when such a link might be found. John SANDERS in 1731 and his brother-in-law Samuel SANDFORD in 1746 had both made bequests to ‘the congregation of dissenting protestants and their place of worship at Old Brentford and Reverend Joseph BAKER’. This would have been the Congregationalists group, and there is a mention via British History Online that there was a meeting house in Ferry Lane, Old Brentford, and that this group attracted many legacies ‘notably those of John Sanders c. 1731....” (John SANDERS left 200 pounds to this church, according to his will). Some baptism and burial records of this group may be held with those of Albany Church, at the London Metropolitan Archives, and I am currently looking into this lead. As to the question of two SANDERS brothers marrying two CROMWELL-related sisters, I have yet to find a reference. Gideon SANDERS no. 3 married Elizabeth GOMB but I could not find a wife’s name for his brother John who died 1731. After extensive searching I do feel sceptical about the lineage and inheritance claims of James Montrose GRAHAM, but there are just enough truths in his claims to be worth pursuing the research. The burning question remains, did the SANDERS/ SAUNDERS family truly gain wealth from a link to the CROMWELL family? Perhaps there are some Cromwell scholars out there who could help unravel this mystery? Or if anyone has some good ideas on this puzzle, I’d love to hear from you! Brother* - William, who has a son, also William, and a daughter Ann. William [jnr] is left house in Brentford, now in occupation of Elizabeth GANDY, Widow. Given the tentative links above between Cromwell and Godwin, Cromwell and Gandy, Gandy and Saunders, it would be worth a look at the Chancery Proceedings at the TNA in the cases: Cromwell v Saunders Bill and two answers 1717 C11/971/11 and Cromwell v Saunders 1714-1760 C11/1710/42. In fact the last two may well have some bearing on the court case referred to in the Gentleman's Magazine of 1828. Brother* - John of Mitcham. His children are: Sarah [IGI chr 12 Nov 1732 Mitcham], John, Robert, Elizabeth, Amy, Oliver. Second Wife - Margaret BENTON. A Robert Cromwell m. Margaret Benton 12 Nov 1702 St Martin-in-the-Fields - IGI and Extracts from Chester's "London Marriage Licenses give the following information: 1702. Robert Cromwell, of Kensington, widower, married Margaret Benton. (Source: http://www.archive.org/stream/houseofcromwellg00wayl/houseofcromwellg00wayl_djvu.txt Margaret died between 5 May 1722 and 23 Dec 1723. A Codicil to the Will of Robert Cromwell, written 23 Dec 1723, tells us that his wife Margaret has died and that now his friend Thomas GRIFFITHS of Paddington is appointed sole executor and his brothers- in-law Benton discharged from responsibilities as Trustees. Mr Francis Griffiths [presumed related to Thomas Griffiths above] is given the right to pew in the Parish Church of Paddington where Robert Cromwell normally sits. A case in Chancery Cromwell v Griffiths where there is only an Answer dated 1739 may possibly be of interest. Robert Cromwell's wishes to be buried in the churchyard at Perivale were clearly carried out as 'Greenford Parva (Perivale)', The Environs of London: volume 2: County of Middlesex (1795), pp. 444-449. URL: http://www.british-history.ac.uk/report.aspx?compid=45418 tell us of the tomb in the Churchyard of Robert Cromwell (1723) and that Robert Cromwell, of Paddington, in the year 1722, bequeathed six pounds per annum for an afternoon sermon on the first Sunday in every month, which benefaction being a rent-charge on certain lands in Hayes, has been several years in arrears. http://www.archive.org/stream/chroniclesofgree00browrich/chroniclesofgree00browrich_djvu.txt states: Another benefactor mentioned is Robert Cromwell, whose tomb may now be seen in the churchyard [Perivale], and is referred to later. He died in 1722, and bequeathed £6 annually (see abstract from his will, page 114) for an afternoon sermon to be preached on the first Sunday in every month, but the Rev. James Mardman, who was rector about Lysons' time (1789), said that sum had been several years in arrear, and the pious wishes of the donor have been ever since disregarded. Robert Cromwell, as the present rector, the Rev. Dr. Charles Hughes, informed the writer, also left £5 to be distributed annually in providing poor widows with scarlet cloaks — but this bequest has not been carried out either during his time or for years before he became rector. This seems in our days to be a very remarkable bequest, but in the later part of the last century the scarlet cloak was considered a fitting, as it was a favorite part of the dress of the peasant women. "The chronicles of Greenford Parva; or, Perivale, past and present. With divers historical, archæological, and other notes, traditions, etc., relating to the church and manor, and the Brent Valley"
and in a revised edition of "The house of Cromwell : a genealogical history of the family and descendants of the protector" BY JOHN GABRIEL CROMWELL, M.A. Oxon., Hon. Canon of Durham, p LONDON 1897, the following extracts from Chester's "London Marriage Licenses." appear as well as details about Walter Cromwell above. 1661. John Cromwell of Eling married Joan Bennett. 1663. George C. of Eling married Elizabeth Bolles. 16S6. Clement C. of St. Dunstan's married Christina Stanniford. 1700. John C. of St. Mary Abchurch married Elizabeth Aston. "With reference to the Cromwells of Perivale, and their possible connection with a family of the same name settled at Ealing, though at an earlier date, a letter appeared in the West Middlesex Standard, of February 15, 1890, signed "A Genealogist," which fur- nishes some interesting information, as follows : — " In the suit Cromwell v. Cromwell (see Chancery proceedings, Mitford, 335, 51), the bill recites the will of Walter Cromwell, senior, of Ealing, yeoman, who was father of the parties. By this, which was dated 16th July, 1668, he devises 'Hangers' to his son, John Cromwell; an annuity of £40 to his wife Margaret ; and to his son Walter an annuity of £7, and 5s. a week ; this Walter, the son, had a daughter, Margaret ; the elder Walter had a daughter, Jane, who married William Godwin, and a grandchild, Henry Godwin : he bequeathed to the poor of Ealing £10, to be paid within six months of his death, and gave his residence to his son, John Cromwell. The executors were Edward MILLET, of Hanwell, yeoman, and Joseph Wade, of Ealing, scrivener. The legacy to Walter Cromwell was directed to be paid to Edward Millet at his own house, and to be applied by bim for the use of Walter Cromwell. Walter, who was the eldest son, disputes his father's will, alleging he was not sane at the date of making it." The result of this Chancery suit, brought in 1680, is not stated. It is well to mention also, for the information of those interested in the Cromwell pedigree, that George Cromwell (signed Crumwell) , of Eling, Middlesex, bachelor, 30, and Elizabeth Bolles, spinster, 21, daughter of Thomas Bolles, of Wallington, Herts, Esquire, " who consents," were married at St. Sepulchre's (St. Bartholomew the Great or Less), London, on 6th Aug., 1663. — Vide Colonel Chester's "London Marriage Licences," 1521-1869 (Quaritch)." Interestingly the surname Godwin which appears above also appears in the documents relating to Gandy (see first page). Quite possibly just one of those many coincidences - or is it? William CROMWELL, was born 24 April, 1693, Cripplegate, London, died in 1772 age 79 and is buried at Bunhill Fields in London. He practised law at Grays Inn and lived nearby in Kirby Street, Westminster, London (which is near St. Andrew’s, Holborn). William CROMWELL married late in life to a widow Mary WESTBY. No mention is made in online sources of an earlier marriage for this William, nor of any offspring, and none were mentioned in wills of William, his wife Mary, nor his mother Hannah CROMWELL. Brothers of William CROMWELL who survived infancy were Richard, Henry, Thomas and Oliver – no Robert was mentioned. I found no mention of any connection to the West or East Indies, although some CROMWELL family members did go there. William CROMWELL’s will of 1772 was fascinating, he seemed very wealthy and owned amongst other things, a painting of Thomas CROMWELL, Earl of Essex, by HOLBEIN, also a ‘valuable powder flask’ which had belonged to ‘my Grt. grandfather O. Cromwell’. William CROMWELL’s wife Mary who pre-deceased him, also left a fascinating will. She died in 1752 in Essex. She was very wealthy, leaving 1500 pounds to William and another 1500 pounds for almshouses in London, to be administered by her sister Margaret BROMSALL. ‘The House of Cromwell: a genealogical history of the family and descendants of the protector”, James Waylen, John Cromwell, London 1897 (online, http://archive.org/details/houseofcromwells00way/). I found the following records for SANDERS/ SAUNDERS in online parish registers via ancestry.com. Specifically, I searched ‘London, England, Baptisms, Marriages and Burials 1538-1812’ and ‘London, England, Deaths and Burials 1813-1980’, from which I chose ‘Borough, Hounslow’ and ‘Parish, St. Lawrence, New Brentford’. Those marked with an asterisk are my known ancestors, not sure about the others. Early records for St. Lawrence, New Brentford go back to the 1500s where the entries are written in Latin. (John possibly the one who died 1731, Edward, Hanna). Possibly a son Gideon also. Five children born 1717 – 1730, four died in infancy. *Daniel SAUNDERS (1747 – 1824), [son of *Joseph. mar. 1. Ann (died 1775) mar. 2. Sarah TONGUE and 3. Mary WARD.] Nine children born 1768 – 1789. (Anne bp. 1768; Elizabeth bp. 1770; Maria bp. 1773; Sarah bp. 1777; Joseph bp. 1779; William bp.1780; *George bp. Dec. 29, 1782; Mary Ann bp. 1786; James bp. 1789). I found the following records for CROMWELL: in the 1600s there was a group of CROMWELLs living in Ealing, Little Ealing/ Eling, who are not immediately or obviously connected to the famous CROMWELLs. Perhaps James Montrose Graham was trying to trace back his CROMWELL lineage and came across some 'famous' names, and put two and two together and came up with five? The PCC will of one Walter CROMWELL yeoman of Little Ealing who died 1632 names his children as Walter, Robert (who had 3 children Anne, Walter, Robert), and Parnell? a daughter who married Geo. LIDGOLD of Hanwell. Walter senior's wife was Anne. He had two sisters Agnes (Thomas) and Elizabeth (WOODS). In various other records there were a few more Ealing CROMWELLs: John CROMWELL of Eling, husbandman aged about 25 married Joan BENNETT of Heston in 1661 [parish register, married St. Leonard, Heston April 18, 1661]; Walter CRUMWELL mar. Margaret POLLORD or POLLET, June 1630, at Ealing [parish register entry St. Mary, Ealing]. George CROMWELL of Eling married Elizabeth BOLLES 1663. Walter CROMWELL of Ealing, yeoman, non-PCC will dated July 16, 1668, wife, son John, and 'several monuments to this family in Feltham Churchyard'. St. Mary's Ealing original parish records show up Jane, Walter and John born to Walter CROMWELL 1632-1636, with another Walter, son of Robert, baptized St. Mary's 1627.